Image © Punya Mishra. 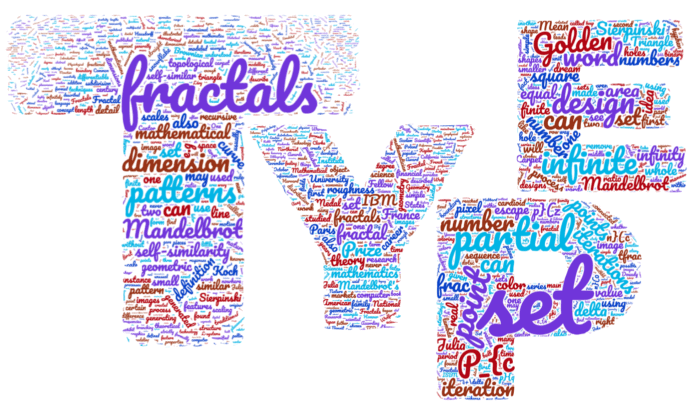 Created using wordcloud.com using text from articles on fractals, Mandelbrot, Mandelbrot Set and self-similarity. At the heart of a fractal is the idea of infinite regress, also the title of the design below, a visual pun as well as a chain ambigram. The iconic image or video of fractals consists of a continuous zoom and the image repeats itself irrespective of how much you zoom in or out. Of course, for an ambigram-artist the word zoom has interesting connotations, as shown in this animation. This zooming into the infinite can be shown other ways as well. For instance consider the two designs below – two different ways of zooming into the word “infinite” (or is it the word “finite”?). Seeing these designs can sometimes make it appear as if the world is spiraling out of control – leading to the next design. So we are now in the strange world of the fractal – geometrical shapes that exhibit invariance under scaling. In other words, a piece of the whole, if enlarged, has the same geometrical features as the entire object itself. The idea of fractals was popularized by the mathematician Benoit B. Mandelbrot in his book, The Fractal Geometry of Nature. So Mandelbrot was an obvious one to play with. 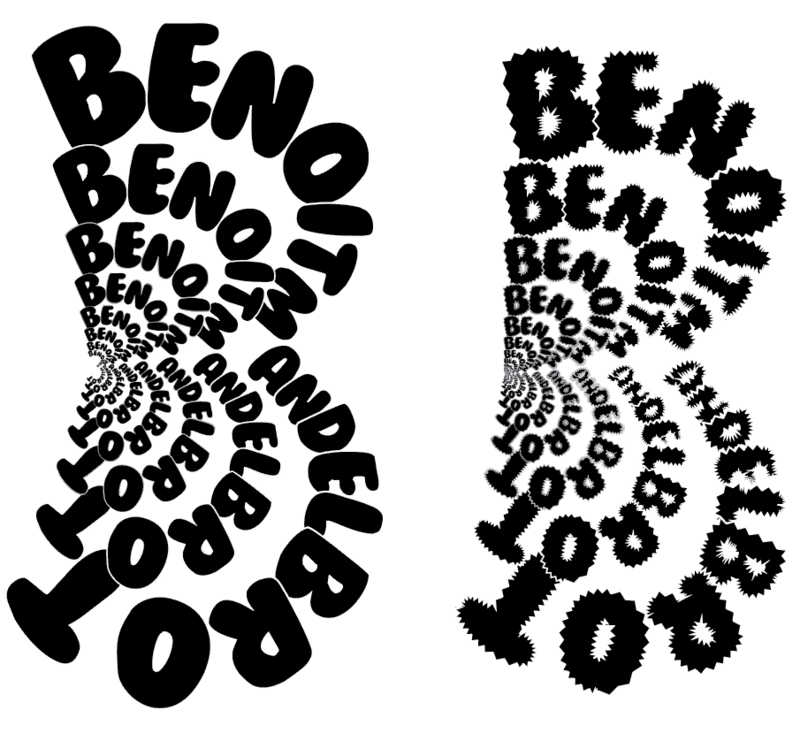 Benoit B Mandelbrot was once asked what the “B” in his name stood for and he is said to have replied “Benoit B Maldelbrot” i.e. in other words his name was a fractal! The next design pays homage to this idea. Mandelbrot’s ideas took root in the popular culture—in the matrix of our daily lives, as it were. 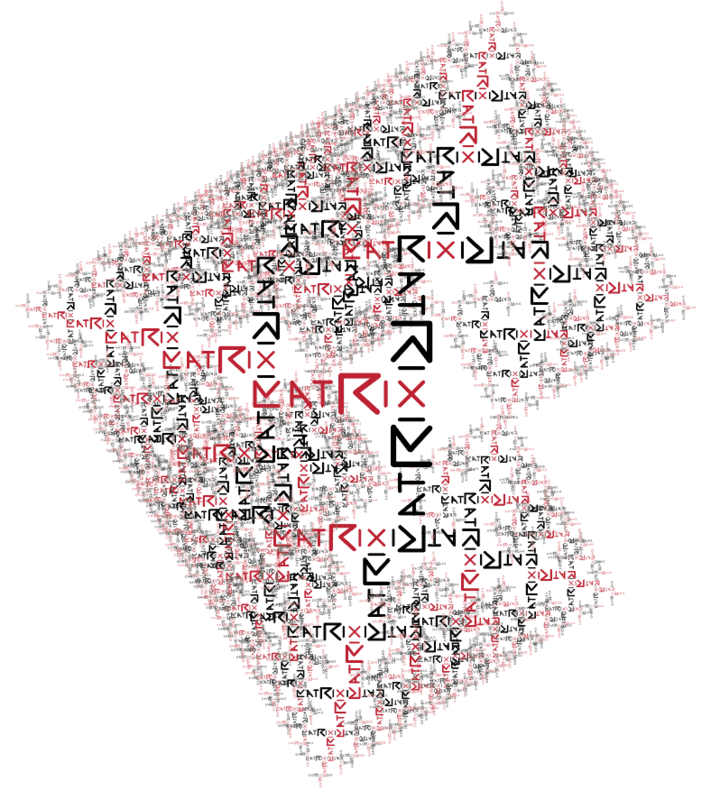 Here are two designs for the word “Matrix” as fractals. The complexity of the Matrix zoom Too can be appreciated only by seeing the entire still image. Click on the image to see larger version! Fractals are not just seen in nature but they can be created, usually on a computer, by an iterative process, where the result of a mathematical equation is “fed back” into the equation itself. The next design for the word “iterate” seeks to capture this idea. This process of iteration leads to the idea of invariance—the fact that things look the same when scaled (up or down). Another word that we often use to describe invariance is “similarity.” The idea of similarity also is key to understanding Mandelbrot’s deep insight— that in some powerful way, the folds of alveoli in our lungs are similar to the ruggedness of a coastline which are similar to the tree-like structure of broccoli. The phrase that may be a better descriptor of fractals, than similarity, is actually “self-similarity.” In other words, a self-similar image contains copies of itself at smaller (or larger) scales. There is a beauty in this idea of fractals. Mandelbrot himself summarized it as “beautiful, damn hard, increasingly useful. That’s fractals.” What Mandelbrot had discovered was something profound, emergent and surprising. It touched something deep within us. It informed us that beauty is complex, and yet all around us, in atoms and in galaxies, in splashes of water and in ragged coastlines. Beauty! You can access all the articles that Gaurav and I have published in one single PDF here or read them as an embeddable document. More of my ambigram work can be found on my page on Mathematics & Visual Wordplay.